Yo, Adrian! He did it! Sylvester Stallone finally got himself a Rocky statue. "Welcome home," Stallone said in an Instagram video. "It only took him, what, only 41 years to get to California." In the video, the statue can be seen coming off a truck to be placed into his home. ESPN's Darren Rovell reports the statue, commissioned by Sylvester Stallone for use in "Rocky III," was auctioned off by SCP Auctions last month for $403,657. The buyer was not revealed until Stallone posted the video. The replica was made around the same times as the original which sits outside the Philadelphia Museum of Art. Both were created by sculptor Thomas A. Schomberg. 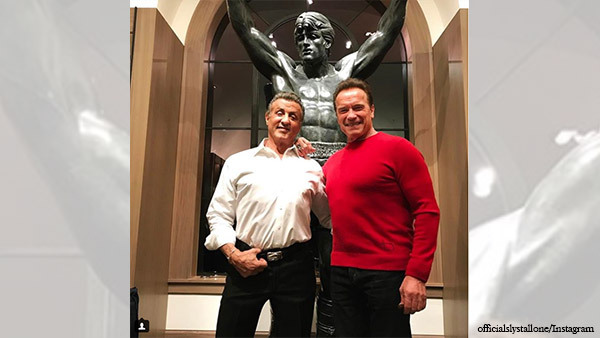 In another Instagram post, Stallone can be seen standing in front of the statue along with Arnold Schwarzenegger. "Well look who drop by on Christmas! @schwarzenegger always fills the room with positive energy!" Stallone wrote.